Dry Gulab Jamun Cheese Cake Recipe, A must try! 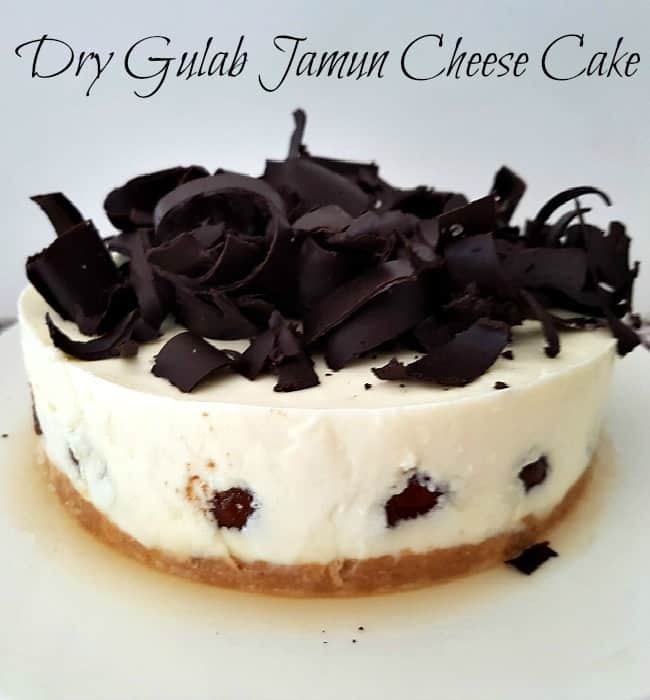 Gulab Jamun Cheese Cake Recipe, step by step pictures and video. This Gulab Jamun Cheesecake is made with Dry Gulab Jamun. Dry Gulab Jamun Recipe made with milk powder is super duper hit on my FB Page. This Gulab Jamun Cheese Cake recipe is a must try Dessert because it too easy to make and also you don’t need too many ingredients. No Egg No Bake Gulab Jamun Cheese Cake Recipe. Made this Dry Gulab Jamun Cheese Cake first time for my Hubby Birthday and came out so well. 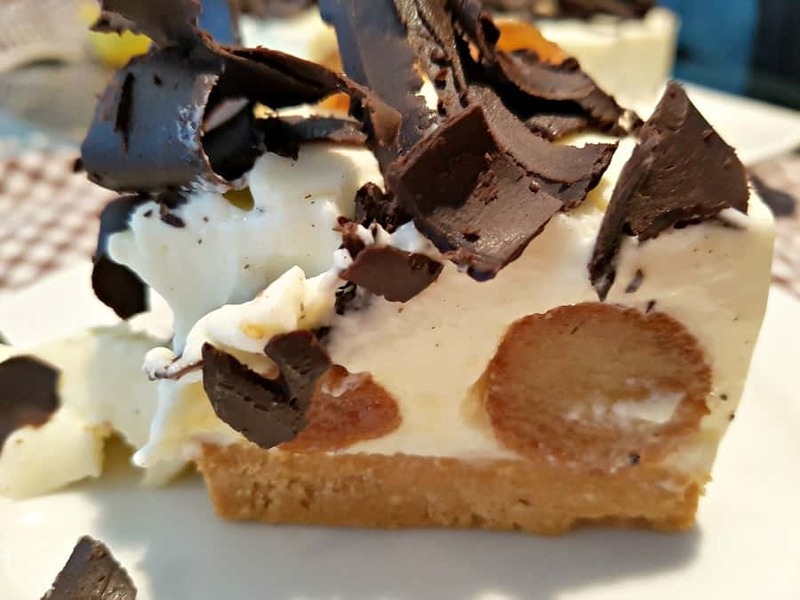 If you are running out of Whipping cream do try this cheesecake recipe, it a fool proof recipe. I had made the Dry Gulab Jamun Last week to update the video but after I made the Gulab jamun I thought to make the cheesecake for his birthday. Before you try cheesecake make ready the Gulab Jamuns, Do check the below video that will help you to make the Perfect Gulab Jamuns without using the Instant Gulab Jamun Mix. Crush the Marie or digestive biscuits and mix with melted butter,press into the base of a 9-inch mousse ring. Dissolve gelatine in warm water makes sure that there are no lumps. Boil the milk and add the dissolved gelatine mix in the hot milk, mix well. Take cream cheese and sugar in a mixing bowl. Beat cream cheese with sugar, till creamy and fluffy. Make sure that you have used the fine sugar so that it will get dissolve soon. Add in the whipping cream and blend well with the cream cheese mix. Add the gelatine milk mix little by little and mix well incorporated. Now take the prepared dry gulab jamun. Arrange the dry gulab jamun over the cheese and refrigerate for 10mins, let it set. Transfer remaining cheese mix over the Gulab jamun and again set it for 3 hours. After 3 hours remove the mousse ring and topped with fruits or chocolate shaves.Cheesecake is ready now. This Gulab Jamun Cheesecake is made with Dry Gulab Jamun.This Gulab Jamun Cheese Cake recipe is a must try Dessert because it too easy to make and also you don't need too many ingredients. You can try with normal Gulab Jamuns and Topped with Jamun also. Make sure that you have mixed the gelatine with the warm otherwise, the cheesecake become watery after few hours. Boil the milk well and then adds the gelatine mix with boiled milk. While adding the milk with the cheese mix add little by little. If the cheese mix is still too thick we can add little more milk also. do try this cheesecake recipe and Enjoy!! !